We interviewed 7 agencies that charge clients to setup analytics dashboards to find out how they do it and how clients benefit. Tired of being evaluated like a cleaning service by your clients, measured only by the completion of your tasks? Chances are, your clients are tired of treating you this way too; data capabilities are the second-most common area where marketing agencies fall short, according to a recent survey of 90 marketers. Since we provide tools for agencies to improve their reporting processes, we have a first-hand view when agencies leverage data effectively. To help the rest, we interviewed 6 agency leaders to discover how they offer analytics services in a way that is mutually beneficial to them and their clients. In some cases, these agency leaders have created standalone analytics services for certain clients. These engagements give clients deep insight into their existing data and inform strategic decisions. In other cases, agencies charge for analytics as part of their marketing retainer. In between running marketing campaigns and implementing technology, they make sure they have time to make the data-driven recommendations that help them maintain their status as a trusted advisor, not just a service provider. Daryn Smith, director of MPULL, helps other digital marketing agencies by providing services that they cannot fulfill in-house; they are a digital agency that helps other digital agencies. They used to spend 3-4 hours per client extracting data from different services and importing it into a monthly report, which only left their account managers 10-15 minutes to do actual analysis. So that they could spend their time on valuable activities, not grunt work, they rolled out real-time dashboards to their agency partners and their clients. Now, they charge a dashboard setup fee and then bill their clients for the analysis hours that will move their agencies forward, instead of hours of pulling and formatting data. This is now time that MPULL can use to test new campaigns and make data-driven decisions. “Efficiency is critical. We sell our clients a growth or results retainer, NOT a deliverables retainer. We want to be evaluated on our digital marketing skills, not our project management skills. So, efficiently monitoring data to inform our strategy is critical. Parker Short, co-founder of Jaxzen Marketing, took on one client who needed help connecting the dots between their marketing team’s efforts and their sales team’s results. Specifically, they knew they were not using HubSpot and Salesforce together appropriately, and leads were lingering as the sales team tried to figure out the best prospects to contact. Jaxzen reconfigured the integration between HubSpot and Salesforce so that the stage of each prospect was clear to all members of the team. Then, they knew they needed to prepare the leadership team to monitor this connection so that it stayed strong into the future. They also needed to measure the business impact of the improved communication. So, they set the leadership team up with real-time dashboards to monitor the impact of these internal changes. He also set up the marketing team with a separate set of dashboards to monitor their own efforts. George Weiner, the Chief Whaler at Whole Whale, has launched a couple side projects to help potential clients right away. Since his agency focuses on non-profits, he launched Whole Whale University to help non-profits with their unique digital marketing challenges. He also launched All Good Text, an SMS-based analytics service that helps non-profit marketing leaders stay on top of their Google Analytics and YouTube data. The idea is simple- executives do not need to track every single metric. They just need an overview. So All Good Text alerts them with weekly updates on 3 to 5 KPIs and their week-to-week change. Ed Brocklebank, the founder of Metric Mogul, works with companies that know the business challenge they want to solve, but do not know the exact KPIs that will indicate success. Their metrics are scattered across systems like Google Analytics, Kissmetrics and Salesforce, and they do not know the exact combination of metrics that will help them optimize their efforts. Ed creates a list of metrics from various services that he can track that will help the company measure its progress towards their goal. Then, he creates real-time dashboards that will track the key metrics across different services. He sets this up for the client so they will be able to track their goals after their engagement ends. They will not need to continuously ask team members to log into each service and extract specific metrics. Linda Kyzar, a senior marketing manager at Stream Creative, makes analytics a required part of every client engagement. 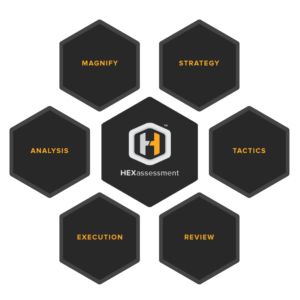 The entire agency uses a framework called a HEXassesment to onboard new clients and create data-driven recommendations for a 3-6 month period. The HEXassesment is a 6-part process they repeat every 3 months to make sure they are doing the most important work. After they determine priorities, they use dashboards to track the impact of their work in real-time. When client meetings approach, hours are not spent on collecting data but instead on analyzing and interpreting the data, and planning strategic next steps. David Carpenter, president of Connection Model, works with a company that rents 5 types of executive office space in 9 cities across the country. So, the company needs to be diligent about renewals and new bookings. Any vacant space is simply money they can never get back! Previously, the company had been waiting until the end of the month to download data from their CRM and then use pivot tables to determine where to focus their ad dollars. Instead, Connection Model wanted to be able to make real-time decisions on where to focus. Since there is only a finite amount of space to rent, they really only needed to focus on cities where vacancy was high or there would soon be vacant space. They set up dashboards with an individual focus on each city. Now, they meet weekly with the client so that they can focus their efforts on only the most pressing needs. So, he uses the Databox Template Gallery to offer free real-time reports outside of the typical reports that they review together each month. Clients can select reports on any data they would like to track, and he will add these new dashboards to the carousel that they analyze every month. The service is free and allows Chase to offer more value to clients with little extra effort. Here’s an example he gave. Analysis Is Not The Valuable Part – Results Are! As you can see in the examples above, some agencies use analytics as a standalone project-based service for specific scenarios. Others include analysis as part of their standard retainers so that they can complete more valuable work for every client. In either case, the analytics themselves are not the valuable part. Clients hire these agencies to take action on analytics. By properly communicating insights from data, agencies can make a fundamental shift from lower-value, inflexible work to higher-value services. “Higher-value” means both the agency and the client benefit more. The agency gets to charge a higher price for their expertise, and the client gets better results that come from data-driven decision-making. How are you going to start using data better in your agency?